1. Water Bead Play: Water Beads are so much fun and provide a great sensory experience for little hands. They come in very small packages and can often be found at the Dollar Tree, Michael's and we bought ours at Tuesday Morning for $0.48 a bag. After allowing the beads to expand overnight I poured them into a a plastic bin with some plastic ocean creatures, palm trees, and a net. B had a lot of fun catching the creatures and the beads. 2. Ice Cream Color Matching- Free from Mr. Printables There are colored ice cream cones and popsicle sticks to match to ice cream scoops and popsicle sticks. 3. 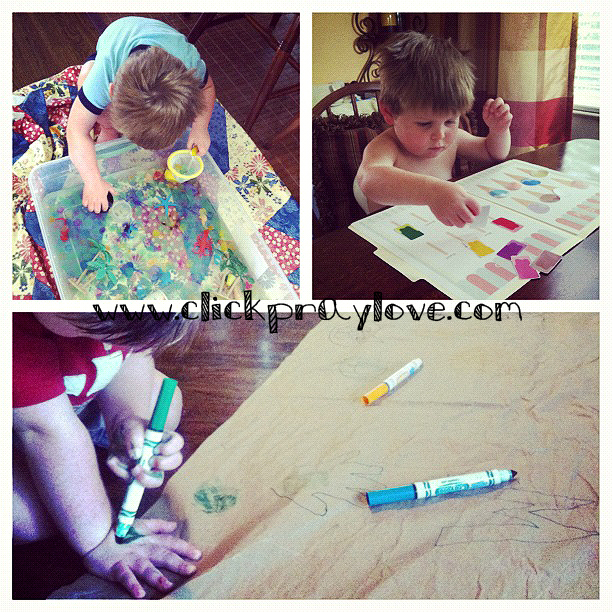 Brown Paper-Floor Coloring- I kept some brown packaging paper that we received from Amazon. I taped it to the floor and B had a blast coloring it with crayons and markers. 1. Melissa and Doug Self-Correcting Letter Puzzles- This is a wonderful puzzle set to have when your child is beginning to associate objects and the letter in which they begin. It contains every letter every the alphabet and one object that begins with each letter. They are self correcting which is great for learning to match appropriately. 2. Melissa and Doug Cutting Food- B received the wooden food as a gift for his 2nd Christmas and he still enjoys playing with it. I rotate toys, so it is not left out all of the time, but when I pull it out he will play with it for several days. 3. 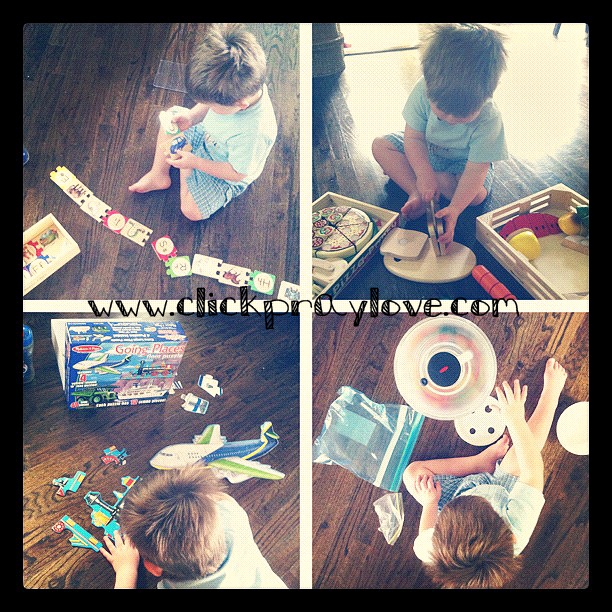 Melissa and Doug Going Places Floor Puzzles- This is a set of 4 puzzles that is pretty challenging. B loves puzzles and is very good at them, but he had this set for almost a year before he could work them independently. 4. Salad Spinner and Pom Poms- This is a fun, easy activity that can be completed with household items. We used pom poms this particular day, but B is known to give small dinosaurs, coins, blocks, etc. a spin from time to time. 1. 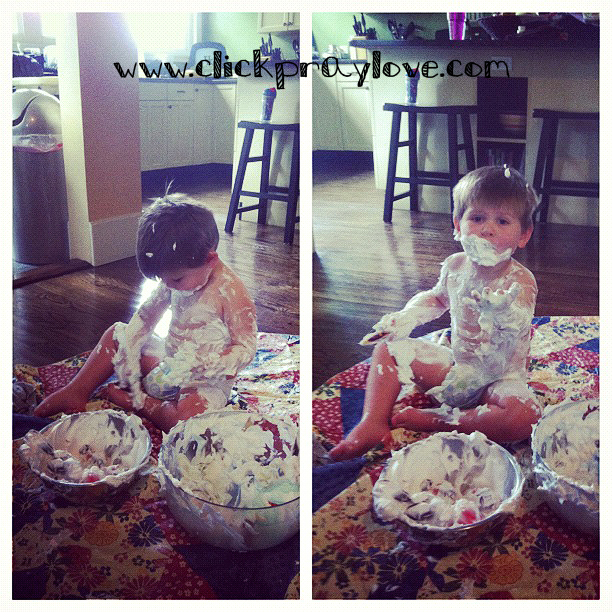 Shaving Cream Sensory Play- This may look a little outrageous, but remember you don't have to let your children get quite this crazy. A better option is putting your child in the bath tub or outside in a plastic pool while playing with shaving cream. B loves shaving cream, but remember to watch the eyes. It does burn. Fortunately, we haven't had a problem with it yet. Neat! We have been having fun with crystal water beads , and I would have never thought to bring them outside. Good to know they are safe for the garden. 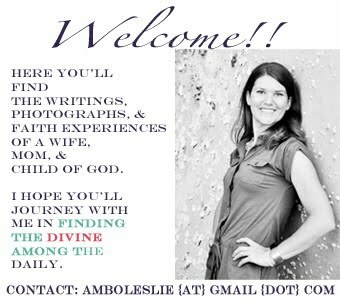 I hope you come by and share this tomorrow at The Outdoor Play Party.